developing and integrating technology into daily operations. Each of our medic units feature cutting edge technology with mobile WiFi hotspots, cellular repeaters, mobile data terminals, wireless transmission of EKG's and iPads. 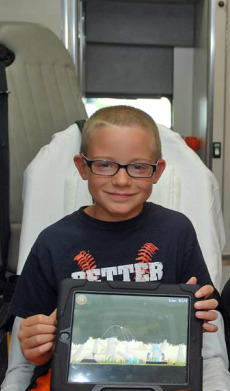 The iPads are utilized for reference materials, documentation & of course patient satisfaction. We've had great success using the iPads as a distraction tool with pediatric patients through games/ apps such as PBS Kids, Angry Birds & Crayola Coloring.